“Behind every good man is a better woman.” That is a saying I firmly believe after being married to my wife for 11 years now. After our first child was born in 2004 my wife and I decided to have my wife be a stay-at-home mom from that point on (or at least for one year). One year has turned into eight, and all along the way, we are making it work financially. That doesn’t go without saying that we haven’t had our fair share of struggles and that organizing our finances takes a lot of work. Daycare – one obvious saving is the fact that you won’t have to pay for daycare. Across the US the average cost of daycare varies a lot depending on the state you live in from $300 to $1564 monthly. The states with the lowest daycare costs are Mississippi, Kentucky, and South Carolina and the most expensive states are Massachusetts, New York, Minnesota, Colorado, California, Illinois, Washington, and Wisconsin. Insurance – through our insurance agency (State Farm) they offer a low-mileage discount for cars that drive less than 7500 miles per year. You can save anywhere from 12-18% if you fall into this category and apply for the discount. Call your insurance agency today. Gas – the national average commute of people in America today is about 16 miles (one way). Based on this national average you could potentially save about $1400 a year on commuting alone (based on a vehicle that averages 20 miles per gallon). Couponing – when our third child was born we got hooked on couponing, and the potential to save a lot of money. Staying on top of this takes a lot of work, but will pay huge dividends in stretching your dollars. Laundry/Drycleaning – keeping up with laundry can be hard, and for a stay-at-home mom it’s no difference. However, the potential is there to do your own laundry more often and save on potential dry cleaning expenses. Work attire – On average people spend about $125/month on their work attire clothing. These costs can especially add up if you have to wear suits or more formal attire on a regular basis. 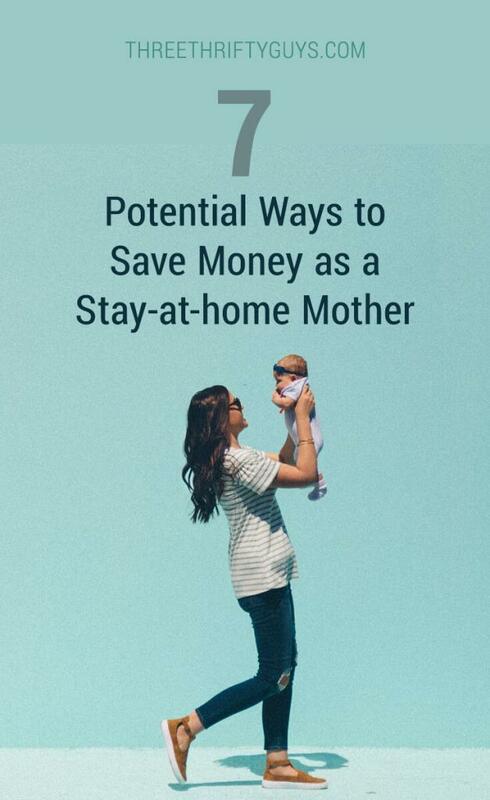 What are some ideas you have for saving money as a stay-at-home mom? Excellent post. My wife wants to have a kid in a few years, so we’ve been debating how we’re going to make it all work when that happens. We are a single income family. With me at home, I have the time to prepare healthful, affordable lunches for my husband to take to work. This avoids him paying $5-$10/day for take out or fast food. I also have more time to spend shopping for insurance policies, getting quotes on any home repairs, and shopping second hand for large items which can all save hundreds per year. We can now take advantage of our electric company’s time advantage program and run the laundry, dishwasher, vacuum, etc. on non-peak hours. I now have time to make weekly trips to the library, parks, and play dates with my kids. This really cuts down on the toys and books that we are purchasing. We were really nervous going to a single income, but it’s surprising how much we’re not missing the extra income. The extra joy and lower stress in our household much outweighs the lower budget! A stay at home mom can also make meals from scratch, giving her family healthier food, and saving money on convenience foods.